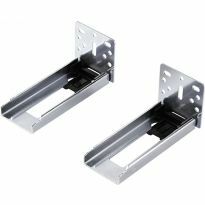 These zinc slides support up to 100lbs and are full extension. 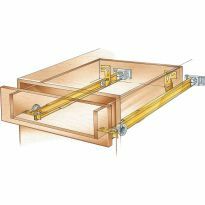 Low profile full-extension slide is ideal for woodworkers looking to upgrade from 3/4 extension slides. Economical low profile slide is only 1-1/2" high. 12'', 14", 16", 20", 22", 24", 26"
as i expected, great quality, mounting was a bit of a chalange, however the brackets that i bought separatly lined up, and all i had to do is figuere the direction. I like. Works as it should . . . I have used these slides in the past and they are trouble-free in my opinion. Just stick to the recommended tolerances and they will provide excellent service. Does the job I intended to use it for. Easy to install, we'll designed, beautifully made. These are the smoothest drawer glides I've used. Have been using this type and brand in all my cabinetry projects for years. For cost, ease of installation, and silent & smooth operation, you won't find better. 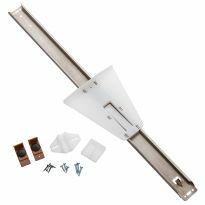 They work great and were easy to install. Deep closets converted to pull out drawers make the entire space usable. Work like a charm. Easy to install. Good and sturdy. My drawers now slide nice and smooth. Very pleased. I'm building a 12 drawer cabinet for my office and have incorporated the accuride 3732 drawer slide in the design. I have built other cabinets and always used Accuride drawer slides over other brands, I think they are the best on the market. Installed quick and easy, glide nice and no worries about overloading them. Very happy with these slides, bought them for shop drawer cabinet going under workbench, fit up well, high quality, exactly what I was looking for, Highly recommend. Slides much smoother than other slides I've used in the past. I like the spring loaded buttons for drawer removal over the levers on other slides. My sister loves these slides I put in her custom pantry cabinet in her kitchen. Built well, slides well, screws included and 100 lb rating is more than enough for most purposes. Excellent slides. Using the face frame brackets made installation easy. Once the kitchen drawers are retrofitted I'm using these to install pull shelves in the base cabinets. Excellent product for a reasonable price - slides were easily installed and provide a smooth action. They appear to be more than strong enough to provide years of service. The full extension is a huge benefit. I doubt that I will consider anything else on future projects. Install easily, work great. Have a kitchen full of them.Most importantly, my wife loves them. The best and a good value. 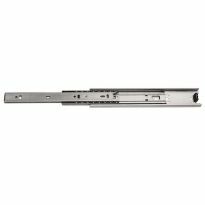 I have used Accuride drawer slides on most of my projects with drawers, (kitchen, bathroom, desks, work bench) and consider them the best. On occasions I have purchased some at the home centers and find the price the same or higher and the quality far inferior to Accuride. Great alternative to slide series 3832. Has &quot;semi-positive closure, is very durable and 18&quot; slide is 20% less than 3832 slide, saving me $75 in my kitchen remodel. Easy to install. Great product. Easy to install, works great. I used the face frame brackets, which greatly sped up the installation in my cabinets. I'll use them again. It came with the installation instructions and was very easy to install. It appears to be very durable as I used this to repair a drawer slide that was of very low quality. Everything was great but the packaging. I bought 12 sets and that is pretty heavy. They were shipped in a single layer unreinforced box. As you would expect, the weight of the hinges made the box fall apart. Tape was slapped on and luckily no slides were missing. I ordered both for a project - using the accuride 100# for the file drawer. what I used on the other two cabinet drawers were centerline 75#. The installation directions were much easier to follow with the centerline slides, BUT the release mechanism for the drawers I like better with the accuride. I think this project was for me - a good side by side comparison of these to brands. The slides work very smooth for my pantry project. East to install with the magnetic jig also. Good strong slides, come with a little oil on them so don't get that on the wood. What can you say about drawer slides? They install great and work as advertised. I've used them often enough that I made my own jig for sizing the drawers and installing the slides. I'll be using these for desks and cabinets for a long time! Easy to install. I also used the optional mounting brackets and found them to be very strong and easy to use as well. Perhaps my only comment would be that for a 12&quot; slide they are rather tight. But otherwise they slide great and work very well. I purchased 6 pairs with the intention of using 2 for a present project then the others for a later project. now a year later I discover the plastic drawer lock at the end of one slide is missing, as in never installed at the factory. Rockler referred me to Accuride to get the part due to the amount of time that has past. The slides do work as advertised but I do worry about quality issues. These slides are ok, but that is about it. I was expecting something a little better. They are rated at 100#, but they don't appear to me they would stand up to that much weight. I was also expecting them to be a bit more smooth of a slide. I love anything Rockler, but I have to say that these slides are a bit of a disappointment. They work fine once they're installed, but but getting there takes some patience. Here are my complaints:1-They're greasy. I know all slides have lubricant on them, but these are really greasy for some reason - worse than any I've ever used. I'm constantly wiping my hands on a rag. I use a lot of light-colored baltic birch drawer stock, and even with the constant wiping I got fingerprints on the wood.2-The plastic drawer releases are cheap and inconsistent. Sometimes they release easily, and other times they don't.3-I don't like any product that tells me to refer to a website for the rest of the instructions. I - like I assume most of you - don't have a computer or Internet access in my shop. Full instructions need to be packaged with the product.As I say, they work fine once they're installed. But overall, they're not up to usual high standards. I've used them before. Very smooth and reliable. Good solution for replacing kitchen drawers. 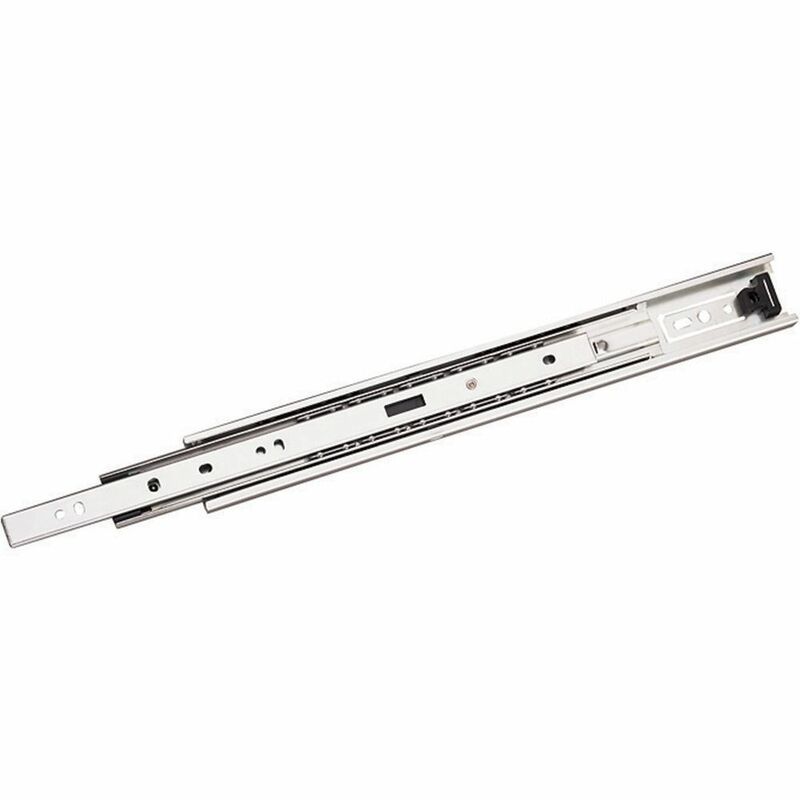 Have used rockler drawer slides in the past--excellent quality and long life. I've used them before and they fit my needs. Redoing a piece of furniture. Accuride is my choice because of smooth bearings. Long experience with Accuride products tells me this is a low-risk selection. Solid quality - worth the premium price. Have used them before and they work great! Building a hutch. this will be for the top level pull out "extra table" of 36" x 16"
Used them before and like the product. To replace the old, worn out slides of our filing cabinet. Needed them for a job I was doing. Highly rate by previous users. Need a sturdy and smooth-operating slide for custom pullout shelves/drawers in kitchen pantry. Too hard to find things on static shelves. The 220lb slides I purchased prior to these were too wide for my application. I thought only 1" clearance was needed, but it was 1.5"
I thought this would meet my need for drawer slides for my workbench drawers. I needed a 26" slide that could carry some weight. Was unable to find it in a store in my area. For drawer project. Have used these before. I need a drawer in my workshop and this is a good price. repairing an old desk railing that's wearing out. I am a big fan of Accuride slides. I have used for a long time and continue using them until I'll find them not working as well. The existing drawer slides are not full extension type & I had good luck with Rockler Woodworking Products before. In my office I have a book case and one of the drawer slides is not working. So I will replace the drawer slide. I've used these before and I needed them for a drawer for a cabinet I built. Great products at a great price. I have a 32 in wide opening so how wide do i build the drawer to accommodate the slides ? BEST ANSWER: Leave 1/2" for each slide, so total width will be 31". Do not leave less than 1/2" on each side or the drawer box will not fit. If you leave slightly greater than 1/2", it's okay as these slides will allow for this with tabs that can be bent a bit to accommodate. 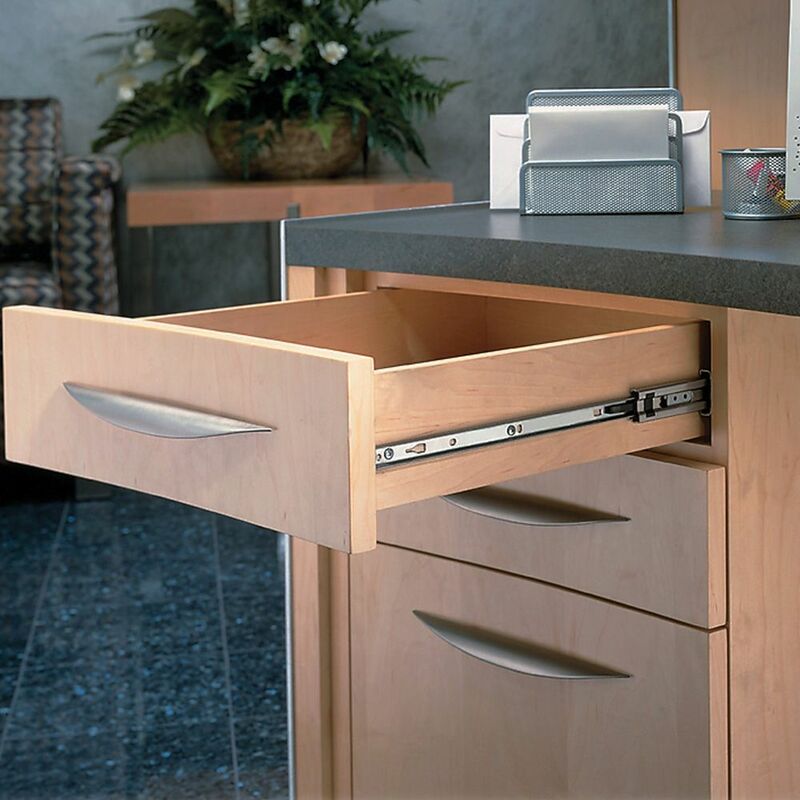 The drawer slides require 1/2" on each side between the drawer and cabinet frame. For a 32" wide opening, the drawer would be 31" wide. the clear dimension required should be on the instructions that come with the slides. Make your drawer 1-1/16 in. narrower than your opening. Can I order there in Black from Rockler? BEST ANSWER: I have not seen these in black anywhere. The Data sheet says you can order them in Black. the code would be a CB before the 3732 . I was wondering if Rockler would be able to do so? Best to send them an email and ask. They have very good customer service. BEST ANSWER: The technical data sheet shows each drawer slide to be 0.50" wide, so it depends on how much space you left on your drawer. I think they typically cost a little more, but I know you can also find under-mount slides that will hold more weight. 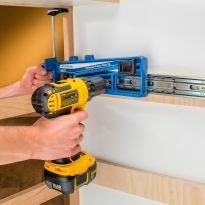 If you are talking about the epoxy wheeled light duty Blum slides that require a 1/2" side of drawer to cabinet face clearance and the heavy duty slides that also (I believe) require a 1/2" side clearance, then yes, they will fit fine. The 3732 slides require 0.5"between the drawer and the side of the cabinet on each side of the drawer. The 3732 is a very reliable slide that I highly recommend. sorry for late response. they is a side clearance required to install the slides if you haven't purchased them already look up the installation info. first. how thick is the fixed portion of the slide? BEST ANSWER: The fixed portion or outside rail of the slide is 7/16" thick on the 3732 slides that I have. I have had really good results with these slides, even catching my 4 yr old granddaughter standing in one of the bottom drawers on her dresser. If I understand your question, it is very close to 1/2" thick, which is why you need 1/2" clearance. You should be able to get the exact dimension by going to their website and looking for the technical specifications too. Could I use these to make a cabinet pull out? There would be no face, it would essentially be a box that slides in/out of the cabinet. BEST ANSWER: Yes. These should work fine for that application. Just be sure to follow the installation instructions and to keep the weight of the cabinet and what's inside it under the weight rating of the item. Good luck with your project! 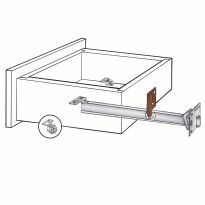 The 3732 slide requires 1/2" clearance between the side of the cabinet and the side of the "box" pull-out. Without a face, you could attach a second wider drawer front on the box to reduce the 1/2" gap on each side. Yes, you just need sides to attach the runners to. Alternatively, I have used these slides to mount on the bottom of a drawer, usually two work better than one, providing balance to the pullout as it is used. Can these be used as undermount slides? BEST ANSWER: I would look for something actually labeled as an undermount slide if I were you. These are designed to take weight pushing in a certain direction. No. Get some undermount slides instead. how do I get them to release to remove the drawer? How do i measure the length of a drawer slide? BEST ANSWER: Lengths of slides are measured as a closed length. The length of the drawer slide is in the description of the project. You want to make sure your drawer slides are as long as possible while still being shorter than the depth of the opening. 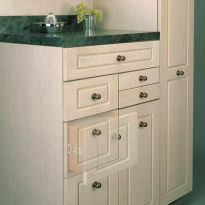 For instance, if your cabinet measures a 24" depth, 22" drawer slides will usually be the longest you can use. Do I need the rear face frame bracket? Does "low profile" mean the thickness is less than the common 1/2" that most other extension slides are? I need a thinner-than-standard slide to replace one that failed, and the slides that are 1/2" thick don't leave enough clearance between the drawer walls and the inner walls of the cabinet. The one I'm replacing is only 3/8" thick. Thanks. do i measure length with the 3/4 inch rear support installed or with out plan to use face frame brackets bare cabinet measures 22 3/4 what length slide do i need? BEST ANSWER: Your question is not super clear... I didn't use the brackets, so it depends on how far those stick out. It sounds like you're cutting it close in regards to your cabinet depth. I used the 22" slides for a drawer that was 24" deep. I think you need to recess the leading edge of the slide 1/8" from the outside edge of the opening. These are full extension slides, it might not hurt to play it safe with the 20" unit. Make sure to clearly punctuate your questions for better understanding. Hope this helps. The slide that I need to replace is Accuride 11053 14" Full extension (this is a cabinet for recycled items and doens't have a lot of weight - what would be comparable in thickness as this seems to be a discontinued item? Thanks.